Dyes used for DNA content analysis will differ in their staining properties, and as such, specific protocols and certain advantages/disadvantages accompany the use of each specific dye. Cell fixation and permeabilization, achieved through various methods, is a requirement for cell cycle analysis with PI, 7-AAD, and DAPI. In addition, some dyes such as PI are not DNA-specific and will stain other double stranded nucleic acids such as RNA – therefore, when using PI, incubation of cells with RNase is necessary. In other circumstances dyes, like DAPI, are DNA-specific and obviate this problem (Darzynkiewicz et al.,2010). Another important consideration when staining cells for this type of analysis is that cell concentrations must be consistent from sample to sample – thereby ensuring consistent saturation of DNA with the DNA binding dye. Otherwise, issues such as peak spreading and changes in G1 peak median fluorescence intensity from sample to sample arise – making experimental comparisons challenging. It is also important to note that the analysis of isolated nuclei may produce more accurate cell cycle characterization as opposed to analysis of whole cells, due to confounding mitochondrial DNA replication in actively proliferating cells (Darzynkiewicz et al.,2010). Dyes like Hoechst33342, DRAQ5™ and Vybrant® DyeCycle allow for DNA content analysis within live samples making it possible to sort the cells by FACS for use in downstream assays on populations in specific cell cycle stages (Darzynkiewicz, 2011). Since these dyes are all membrane permeant no fixation/permeabilization step is required. An important consideration to remember when anlayzing live stem cell populations is that drug efflux due to the high expression or P-glycoprotein and other multi-drug resistance pumps can occur which will prevent DNA saturation and the identification of a clear cell cycle profile. On the other hand, the dye efflux property of stem cells has been shown to be quite useful for identifying stem cells within a heterogeneous cell population through side population analysis. 2-Dimensional cell cycle analysis uses an additional parameter, such as proliferation, simultaneously with a stoichiometric DNA-binding dye to more accurately identify cells within different cell cycle stages (Darzynkiewicz and Zhao, 2014). For example, DAPI staining may be combined with fluorescently labelled-EdU or BrdU. 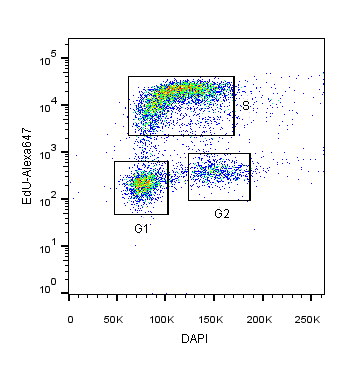 In this assay, cells in S and G2 will not only have increased DAPI intensity relative to G1 cells but also fluorescence corresponding to EdU/BrdU S-phase incorporation (Figure 1). Figure 1: HEK293T cells co-stained with DAPI and EdU-Alexa 647 DNA binding dyes for the specific identification of cells in S-phase versus G1 or G2M cell cycle phases. Staining for other markers associated with proliferation [such as; Ki67, phosphohistone H3, PCNA (proliferating cell nuclear antigen), Topoisomerase II and cyclin expression) may also be combined with a stoichiometric DNA-binding dye for increased accuracy and resolution in cell cycle analysis. The FUCCI system of cell cycle tracking relies on the cell-cycle dependent oscillating expression of two proteins, Geminin and Cdt1 (Sakaue-Sawano et al., 2008). The expression of these proteins is regulated via cell cycle-dependent ubiquitin-mediated proteolysis. Cdt1 expression is high during G1, whereas Geminin expression is high during the S, G2 and M phases. As such, detection of the expression intensity of these proteins may be harnessed to determine the cell cycle profile of cell populations. When non-functional variants of these proteins were linked to different fluorescent indicator proteins and expressed in HeLa cells, the detection of fluorescent signals i.e. either from the presence of Ctd1 or Geminin, was correspondingly indicative of cell cycle stage (Sakaue-Sawano et al., 2008). Figure 2: Screening cell cycle progression using Fucci cells. (A) Fucci cells were transfected with pMZS3F-BORF1 or left untreated and then stained for the FLAG tag on BORF1 and imaged for mKO2 (G1 cells; red), mAG (S/G2/M cells; green), and FLAG (blue). An overlay of red and green image layers revealed cells in G1/S, which display a yellow to orange color (bottom). (B) Fucci cells transfected with pMZS3F-BORF1 and stained for the FLAG tag on BORF1 were FACS sorted into FLAG-positive and FLAG-negative cells (left) and then further separated based on the expression of mKO2-Cdt1 and AG-geminin (middle and right). 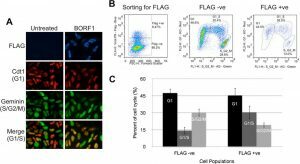 (C) Cell cycle stages determined from FACS analysis (as for panel B) were quantified for FLAG-positive (BORF1) and FLAG-negative cells from three independent experiments. Darzynkiewicz, Z., Halicka D. and Zhao, H. (2010) Analysis of cellular DNA content by flow and laser scanning cytometry. Adv Exp Med Biol. 676:137-147. Darzynkiewicz, Z. (2011) Critical aspects in analysis of cellular DNA content. Curr Protoc Cytom. Apr. Unit 7.2. Sakaue-Sawano A., Kurokawa H., Morimura T., et al. (2008) Visualizing spatiotemporal dynamics of multicellular cell-cycle progression. Cell. 132 (3): 487-498. Leers, M.P., Schutte, B., Theunissen, P.H., Ramaekers, F.C. and Nap, M. (1999) Heat pretreatment increases resolution in DNA flow cytometry of paraffin-embedded tumor tissue. Cytometry 35: 260-266. Rabinovitch, P.S. (1994) in Darzynkiewicz, Z., Robinson, J.P. and Crissman, H.A. (eds.) Flow Cytometry. Methods in Cell Biology, 41, 264-296. Academic Press, Inc., San Diego. Darzynkiewicz, Z., Robinson, J.P. and Crissman, H.A. (eds.) (1994) Flow Cytometry. Methods in Cell Biology, 41 & 42, Academic Press, Inc., San Diego. Rabinovitch, P.S., Torres, R.M. and Engel, D. (1986) Simultaneous cell cycle analysis and two color surface immunofluorescence using 7-amino-actinomycin D and single laser excitation. J. Immunol. 136, 2769-2776. Watson, J.V., Chambers, S.H. and Smith, P.J. (1987) A pragmatic approach to the analysis of DNA histograms with a definable G1 peak. Cytometry 8: 1-8. Hedley, D.W., Friedlander, M.I., Taylor, I.W., Rugg, C.A. And Musgrove, E.A. (1983) Method for analysis of cellular DNA content of paraffin-embedded pathological material using flow cytometry.J. Histochem. Cytochem. 33: 1333-1335. Vindelov, L.L., Christensen, I.J. and Nissen, N.I. (1983) A detergent-trypsin method for the preparation of nuclei for flow cytometric DNA analysis. Cytometry 3, 323-327.